Do you favor rustic landmarks, like early log structures? 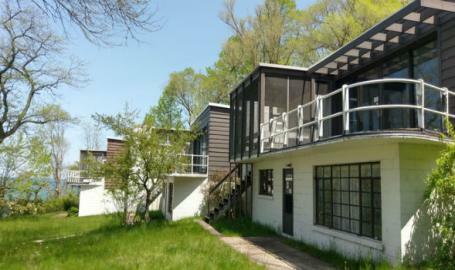 Or are you a fan of Mid-Century Modern-style houses? Either way, we’ve got you covered on the Logs to Lustrons tour. Indiana Landmarks and the National Park Service (NPS) team up to present a dozen landmarks spanning a century of architecture in the Indiana Dunes National Park, including restored residences not normally open to the public and vacant landmarks in need of a new use. Eight interiors will be open for touring. For the tour, you’ll ride a shuttle that departs from the Indiana Dunes Visitor Center to a dozen sites that date from the mid-nineteenth to mid-twentieth centuries—log structures from early settlement days, frame homes from the Victorian period, and mid-century homes of glass, stucco and metal. Children who join the tour (with parent or guardian) can earn a Junior Ranger badge by picking up a workbook, program, and a bag with sketchbook and pencil when they check-in at the Visitor Center. At the end of the tour, they show the completed workbook to a Park Ranger on the bus or visitor center to earn a badge. Children under 16 are welcome to attend the tour for free, but will still need to reserve a ticket. Choose your timed entry ticket and departure time: slots available every 15 minutes beginning at 8:30 a.m. with the last tour departing at 2 p.m., Central Time. The tour lasts approximately three hours, depending upon how much time you choose to spend at each site. The tour sites will close at 4 p.m., Central Time. Box lunches are also available for an additional $11 made by Third Coast Spice Cafe. You have a choice between a vegetarian option or one of three meat choices and can be purchased on the ticket page. If you chose to purchase a box lunch, you will be able to pick them up between 10 a.m. and 3:30 p.m. at the Beverly Shores Museum, a shuttle-stop about halfway through the tour. Picnic tables are available at the site.